(Lowell, MA) Writers must walk a fine line with audiences when it comes to parables. For a parable to be effective, the story must signal its intentions early and clearly. If done well, it gives the story license with the audience to present an incomplete worldview to prove a point. The devil, however, is in the details – as in what details to give the audience and what details to leave out – to create a world that gets enough buy-in from the audience to think about the issue. The goal of the earnest and often funny Merrimack Repertory Theatre production of Native Gardens is to create a space in which we can examine the tensions between our nation’s immigrant roots and our nativist impulses, particularly now when that tension is at its ugliest in recent memory. To do this, author Karen Zacarías creates a seemingly benign situation of a Hispanic family moving into a fixer upper in a Georgetown neighborhood next to a white family that has been there for a longer time. Tensions soon arise and both sides behave badly in silly ways. Tania (Vivia Font) and Pablo (Gabriel Marin) buy a fixer upper with dreams of what it, and their career paths, might become. She is very pregnant and finishing a dissertation, and her nesting instinct manifests in her dream to create a garden with native plants in the backyard. He is a first-generation immigrant from Chile who is trying hard to get a foothold in a prestigious law firm. Their neighbors are Virginia Butley (Navida Stein) and Frank Butley (Joel Colodner), an older couple who have watched the neighborhood slowly change over the years. She has had to fight for her career success every step of the way in the defense industry and he is retired, but anxious about having the perfect English-style garden in the backyard. Pablo volunteers his unfinished home for a party for the firm in just a week’s time after moving in, and Tania takes it as a challenge to accelerate her timeline for a garden. The two soon discover that there has been a mistake in the boundaries marked by a worn-out fence, and that their property actually includes part of Frank’s manicured garden. Fence, boundaries, you see where this is going. The premise could be effective, but there were several shortcomings in both the script and the production which could easily pull the audience out of the parable, and we are asked to suspend belief too quickly and for too much to become firmly invested in the outcome. For one, the idea that Tania would so readily agree to pull off a party when she is very pregnant, finishing a dissertation and moving into a ramshackle house would work in a 1950’s sitcom, not here. Not only don’t I buy that she would agree, I don’t buy that it would even be possible for them to get the necessary permits, inspections, and landscaping work done in the time allotted in an place that must love its zoning laws like Georgetown. Secondly, and this is more specific to the production itself, Frank and Virginia too readily assume that both Pablo and Tania are foreigners when they meet them. For Pablo, it’s readily apparent to assume this with his accent, but Tania has no such telltale signs. In this production, she, like he, is fair skinned, speaks English without an accent, and only speaks Spanish onstage when she swears later in the production. Of course there are many fair-skinned Hispanics in the U.S. – that’s not the problem – there just isn’t a signal in the first conversation between the two couples that would logically allow cautious Virginia and Frank to jump to the conclusion that Tania is from Mexico (she’s not). What’s frustrating about these incongruities is that they could so easily be fixed by stretching the timeline of the party out to a month, rather than a week, and giving Virginia and Frank a few more breadcrumbs in the script or in the staging of Tania’s Hispanic roots before jumping to a wrong conclusion. These bumps in the road dull the impact of the poignant and sometimes hilarious action that follows, but not entirely. The parable of the shortcomings of good fences is one that resonates, and as the action unfolds, the cast work in hilarious synchronicity to show the relatable idiocy of all involved in this domestic misunderstanding. 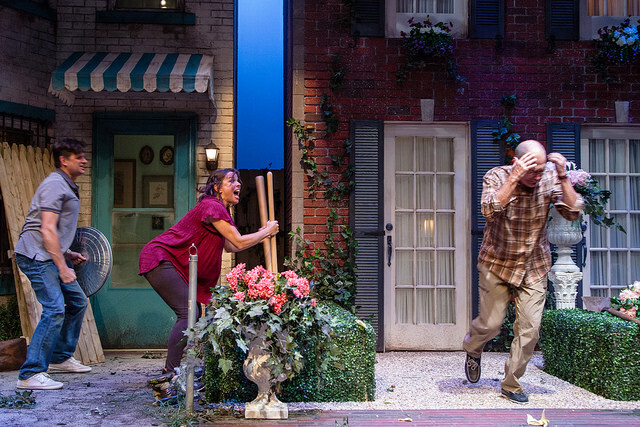 They are aided by awe-inspiring set design by Alexis Distler, who manages to bring the outdoors inside while still making it feel as claustrophobic as a backyard when you don’t get along with your neighbors. This play doesn’t always work, but its earnestness is more worth your time than many slicker productions. It’s better to start an incomplete and fitful dialogue on the issues ripping us apart than to stay silent and wait for the perfect dialogue to form. This entry was posted in Comedy and tagged 2018, Craig Idlebrook, Gabriel Marin, Giovanna Sardelli, Joel Colodner, Karen Zacarías, Lowell, MA, Meghan Moore, Merrimack Repertory Theatre, Mexico, Native Gardens, Navida Stein, October, September, Spanish, Vivia Font by craigidlebrook. Bookmark the permalink.